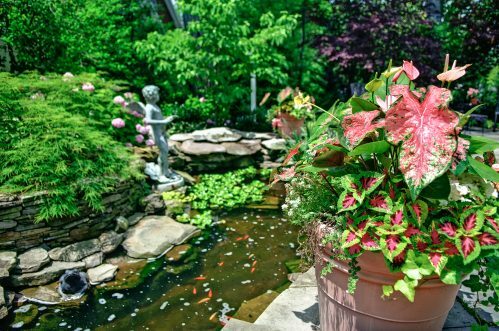 From rose beds to retaining walls, hedges to hollyhock, and walkways to waterfalls, Beautiful Gardens will help you design a garden that fits your yard, your budget, and your personality. Our specialty is providing every client with a garden that fits their lifestyle and their budget. We do that by emphasizing thoughtful, attentive customer service and attention to detail. Whether you’re starting from scratch, reinventing an old space, or simply sprucing up a neglected garden, we will work with you to create a feature of beauty and enjoyment. A well-designed and maintained outdoor space will enhance the enjoyment and use of your home and add to your home’s value. Beautiful Gardens is a locally-owned and operated business serving Northern Virginia. Sharon Bonitt is a graduate of the George Washington University Landscape Design Program, member of the Landscape Designers’ Group, member of the Association of Professional Landscape Designers, and holder of a Virginia Class B Contractor’s License. Beautiful Gardens is a custom landscape design and landscape maintenance firm serving Northern Virginia. We are dedicated to ensuring that your garden is one of elegance and tranquility that enhances your enjoyment of your outdoor space.